A few years ago I made this ornament to give to a few neighbors, coworkers, etc., although I had originally used a different quote. It is inexpensive and super easy and quick, too. In this version I didn't use the entire Footprints in the sand poem, but just edited it down to a phrase. You can adapt this idea to suit your preferences. 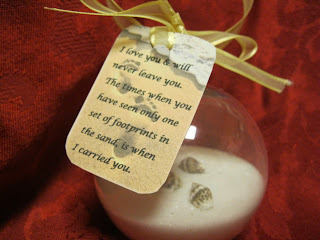 The Second quote I used several years ago was: When you see this ornament upon the tree, remember the Man from Galilee. I used a picture of Christ walking along the shores of Galilee as the background picture. 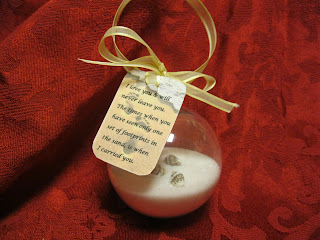 1) Pull metal cap off the ornament. 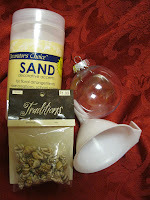 3) plop 3-4 mini shell beads into the ornament so they rest on top of the sand. 5) hole punch the top of your poem tag and attach through the metal hanging loop with a ribbon tying a bow to finish it off. 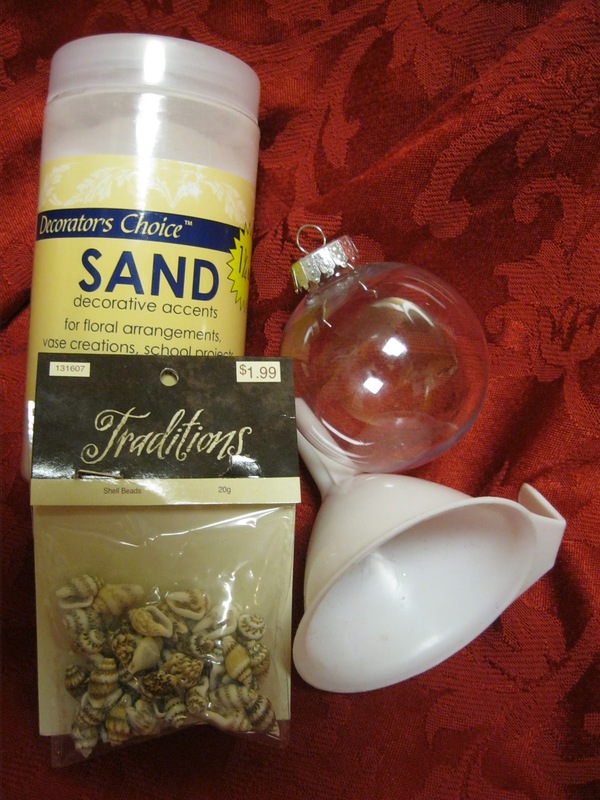 Jan's tip: Buy the sand & the ribbon at the dollar store not the craft store. I didn't find small enough shell beads at the dollar store so bought them at the craft store. Another way to maybe make this would be to print the poem out on clear transparency paper as a wallet sized photo size. Cut it out and pop it inside the ornament so the bottom of the transparency rests on top of the sand and the top corners curl around the top part of the glass ball which will hold the transparency in place. I haven't tried this yet, but somewhere around the house I have a left over transparency of Christ from putting them in ornaments. If I find it I'll do it and upload a photo so you can see if you like it. I love this idea. We have a Princess Day coming up in a few weeks and I am looking for ideas to support our 'Walk by Faith' theme. 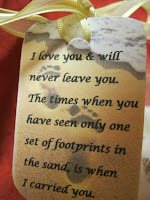 Many of the girls will not be from church so the Footprints poem will be new to them.